What is Japa Yoga ? 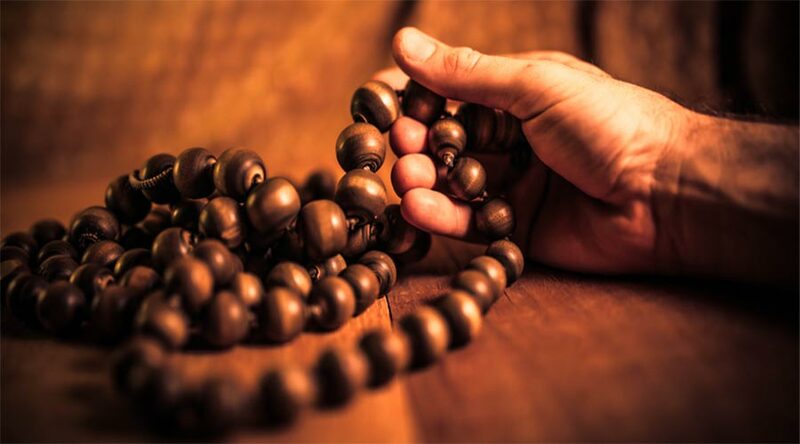 What Is A Mala and why is it needed ? The constant repetition of a Mantra is known as Japa. Japa Yoga means union of the self with the highest existence through the Japa. The purpose of japa is to awaken the psychic awareness. Of all the systems of Yoga used to awaken the psychic awareness and intended to lead eventually to Samadhi, Japa Yoga is the easiest. A Mantra is the first requirement for the Japa Yoga. The Rosary or Mala is another need for Japa Yoga. A Mantra is not the name of a god or goddess or of a person, and as such it has got nothing to do with any religion. On the contrary, it is a vehicle for the expansion of mind and liberation of energy. Mantras are a group of words, or a grouping of sound vibrations which have an effect on the mental and psychic consciousness of the practitioner. Mantras were first heard by the Yogis in the higher stages of their consciousness, and they passed them on to society, to bring happiness to the neurotic and the confused, to show man the way to real happiness and to even get rid of a vicious circle of life and death. A Mala or rosary beads is a string of small beads, usually 108 in number and separated from each other by a small knot called BRAHMAGRANTHI. At one point in the Mala there is an extra bead, known as SUMERU or summit of the Mala. While practicing Japa, the mind tends to get distracted from the Mantra, towards extraneous thoughts in the case of beginners, or unconscious and psychic phenomena in the case of advanced practitioners. In such cases the rotation of Mala or Rosary beads becomes automatic, and Japa continues with the awareness lost. But as the fingers reach the Sumeru bead, the awareness is brought back to the Japa. While travelling to a faraway place, there are many milestones on the way, which act as a check and tell the progress of journey. Similarly Sumeru Bead act as a milestone in the Japa, whereas Mala is like a road. Both road and milestones are essential as they ensure that the psychic destination is reached. Therefore Mala act as method for checking and detecting those moments when one becomes unaware and forget that he is doing Japa. It also give an indication that how far one has progress in the practice. One explanation goes like this – Digit ‘1’ represents the supreme consciousness; while ‘8’ represents the eight aspects of nature consisting of the five fundamental elements of earth, water, fire, air and ether, plus ahamkara (individuality), manas (mind) and buddhi (sense of intuitional perception); ‘0’ represents the cosmos, the entire field of creation. There are some scholars who believe that 108 represents the number of skulls on the garland worn by Kali, the goddess of destruction. There are many more explanations in different scriptures. But actually, the meaning of these numbers (108) has significance at a deeper psychic level. They are numbers that have been found suitable by the practical experience of ancient Yogis and Rishis. They are numbers that have been chosen by those Rishis and Yogis to help bring about auspicious conditions whilst doing Japa. While using a mala, one should never cross the Sumeru. When you begin your practice of Japa with the rotation of the Mala from the bead just next to the Sumeru and return to Sumeru completing one rotation of Mala, at this point you simply reverse the mala and continue your practice. Three fingers are used for holding and rotating the mala: the thumb, the middle finger and the ring finger. The index and the smallest fingers are not used at all. Join the tips of the thumb and ring finger. Rest the Mala in the small groove formed between the thumb and finger. Rotate each bead one after the other using the third finger. Rotate the mala towards the palm of the hand. Note that the mala which is used for japa should not be worn around the neck. Hold the mala in the right hand. Japa should be done while holding the right hand near the heart, with the right forearm resting lightly against the body. Gomukhi means shape of cow’s mouth. It is a small bag of cloth which resembles the shape of a cow’s mouth. The Mala and the right hand both should be placed inside this Gomukhi so that they both are obscured from view. While rotating the mala, with the hands inside the Gomukhi, the bottom of the Mala is supported by the bottom of the bag. Gomukhi prevents other people interfering with the one’s practice. As far as a devotee is concerned, who constantly remember the name of his or her deity, their Bhakti Bhavna ( strong feelings of love ) are strong enough to take them to goal and they do not need the correct pronunciation of Mantra. But those who do not have that strong feelings or inclination towards Bhakti, should take care in the pronunciation of the Mantra. A Mantra make an impression on the psychic superstructure of the mind and to get the right effect, the pronunciation should be perfect. Also one should not change the pitch or the intonation of the Mantra. The practice of Japa should be done alone. Don’t explain the experience of Japa to others. Don’t change your Mantra as it will create a confusion in the psyche. Don’t overdo Japa. The Mantra given by Guru should be practiced as per the guidelines of the Guru. It is not advisable to take or select a Mantra from a book or scripture. Take the guidance of Guru or an experienced teacher in Japa Yoga.